The emergence of Muslim republics has been part of a larger transformation experienced by the Middle East in the 1990s. The main purpose of this volume is to examine the impact of the transformation on the Middle East, especially Turkey and Iran. "Interestingly, although much has happened to make the book look out of date since most of the articles were written, many of the basic premises remain." Contemporary Review- " a welcome and important contribution to assessing the impact of the newly independent states of Uzbekistan, Tajikstan, Turkmenistan, Kryrgyzstan, Kazakstan and Azerbaijan … this region has long been invisible on the world stage and consequently, this volume deserves to be on the reference shelf of every public and university library … this should be required reading for anyone interested in world affairs. It is moreover a collection of very well written, vivid essays which readers will find informative, animated and provocative"
"Although the chapters were dated by the time they were published, they nonetheless contribute to understanding the significance of the six Turkic republics of the former Soviet Union in terms of an enlarged Middle East." 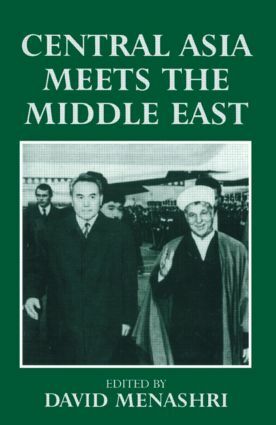 Middle Eastern Studies- " This well-edited and well-argued volume is not only a definite contribution to the study of the regional dynamics of the Middle East and Central Asia, it is also a significant contribution to the more general study of the transition from cold was to post-cold war period. The essays in this collection are based on a broad command of sources, well-argued, well worth reading and well worth thinking hard about.